Jesus never fails. When facing difficulties in life, it’s a message that Christians everywhere need to be reminded of. As he traveled the world as the founder of LHF, meeting Christians young and old, Rev. Robert Rahn came back to this message again and again. Finally, he decided the time had come to write a small booklet or tract that could be shared with anyone needing to hear the Good News. LHF first published the booklet in English in late 2018, encouraging readers to share with shut-ins, the hospitalized and imprisoned. Those copies soon disappeared, and a second printing was claimed just as quickly. 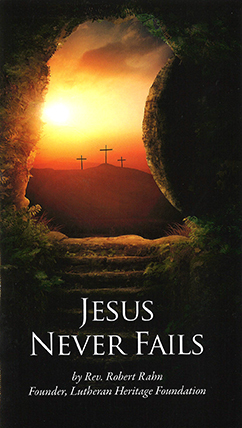 Now, a third printing of the little 12-page booklet (40,000 copies) is underway, but just as excitingly, its message of peace and everlasting life as a child of God is being embraced in more than a dozen countries. Last night as I was sleeping, I got a call from an unknown number which woke me up at around 12:30 a.m. I wanted to ignore it, but the caller persisted and I decided to answer the call. The caller was a man; he started first by apologizing for calling at the middle of the night. “This booklet helps the common people in my country – who live in constant fear about what they will eat or drink, sickness and so many other things – to understand that they can rely on Jesus Christ, who does not fail even when everything else is not working,” Bishop Anibati said. English, Russian, Latvia, Zande and Kusaal, spoken in Ghana. 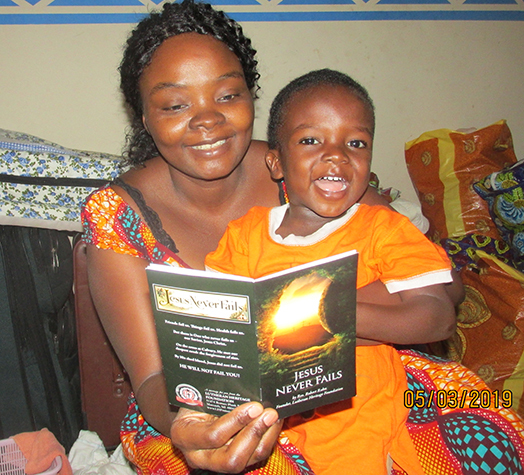 The booklet was recently dedicated in Ghana by Rev. Dr. Nicholas Salifu, a pastor in the northern part of the country. “After the [dedication] service all those who attended were the first to receive the booklet and other books. The line was long but everyone got a copy,” Rev. Salifu said. “Sometimes on market day, [a member] Foster Abugnaba sits at vantage points, and as people go, by he explains what the books are. Those interested take copies free of charge. People also go to Madam Elizabeth Akum’s house to take copies. The books are stored in her house at Kpalugu, on a major main road. To order copies in the United States, email LHF or call the office at (800)554-0723. The booklet is also available in several languages in PDF format.